For many people, just the mention of Brussels sprouts seems to bring about a look of disgust. Chances are they were probably forced to eat a boiled, mushy version of them as a child, and swore that they would never eat them as an adult. If you are one of those people, and you've never grown Brussels sprouts in your garden because you hate them, I challenge you to grow them this year. Harvest them from your own garden, cut them in half and roast them with olive oil and salt. The result is more like a cabbage French fry then cabbage mush. Not only are they high in vitamins and are said to have cancer fighting properties but, when prepared well, they are delicious. Plant: Mid to late May is a great time to plant Brussels. One of the reasons Brussels are planted so late in the spring around here, is that many people believe that the sprouts actually taste better when they have been exposed to a light frost. In late summer, remove the top 6-8 inches of your Brussels sprouts plants. This will encourage the plant send energy into developing larger sprouts over the next couple of months, just in time for a nice light frost. Brussels can grow up to 36 inches tall and 24 inches wide. They are best when transplanted. Space plants 18 inches apart. Like all brassicas, we recommend mixing 1/4 cup of balanced fertilizer, like this Dr. Earth Organic 7 All Purpose Fertilizer , into the hole when planting. If you have seed, and are eager to try direct seeding, you can do so by planting 3 seeds in one spot, every 18 inches. Once they've sprouted and the seedlings are about 1 inch tall, thin down to one plant per 18 inches. Be sure to feed your direct seeded plants with a foliar feed that is high in nitrogen, such as Dr Earth Nitro Big Fertilizer on a weekly basis once they've sprouted. Once the plants have reach 4 inches tall, change liquid fertilizer regime to every 2-3 weeks. 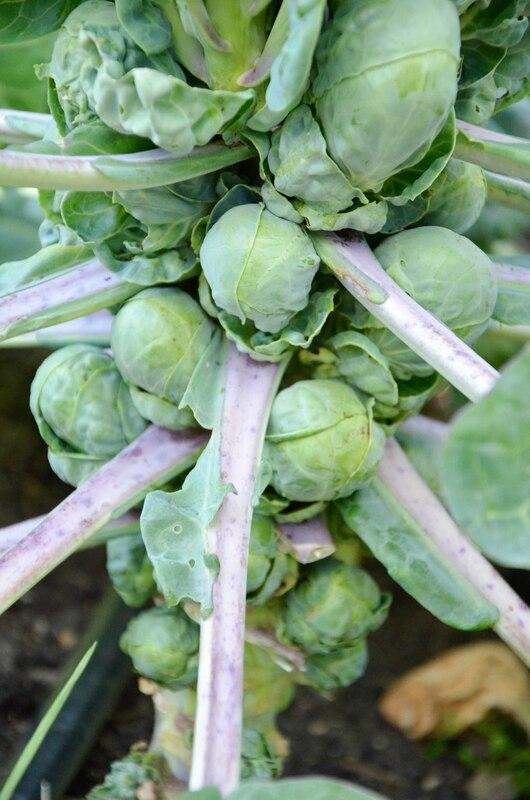 Once the Brussels start to put on sprouts, we recommended that you remove the lower 6-8 leaves on your plants. Be sure to also remove any yellowing leaves the plant may have. Around this same time (usually late summer), you will notice a small, cabbage-like flower forming at the top of your plant. Cut this off to encourage the plant to send more energy into the sprouts. Eat the top after you cut it off! They are delicious sautéed or roasted. Harvest: Late-spring planted Brussels should be ready to harvest in early fall. If sprouts feel tight and dense when squeezed, you can pull or cut them off the main stem. We usually just harvest our Brussels sprouts off of the stalk as needed, but these days it seems a popular among our clients to cut down and roast the entire stalk for a special occasion. If temperatures are going to drop below 20 degrees, be sure to harvest all or your sprouts and bring them inside because they will rot after a few hard freezes. Storage: The sprouts will store for several weeks in a sealed container or plastic bag in the refrigerator. If freezing the sprouts: blanch for 3-4 minutes, then dry and freeze immediately.